Let the Professionals at TJ’s Painting Company take care of your painting project and turn your space into a clean, seamless work of art. 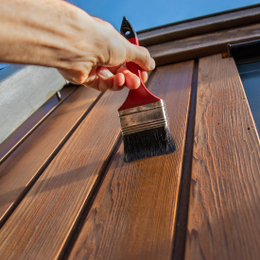 THERE ARE SOME JOBS around the house that can be fun do-it-yourself projects, but there are others, such as painting, that can be more troublesome and frustrating. Blue tape everywhere, not happy with the color you came home with from the hardware store and a complete mes s in your house—those can all be avoided when you have professionals like TJ’s Painting Company take care of your painting projects. TJ’s Painting Company can turn any bland space into a beautiful, clean end result and they a re there for all your painting needs—exterior and interior painting, as well as custom trim work, crown molding and shadow boxes to complete the finished look. A family-run busin ess for almost 20 years, Mike Brennan runs TJ’s Painting Company with his father, Tom, who founded the business in 1999. The company has grown substantially and the bulk of its work is high-end residential painting. They pride themselves on offering the highest quality product and developing a relationship with the client from the first phone call. Not only is their business run efficiently, they st and out from other companies because their staff doesn’t just include painters—a color consultant assists in every project, helping homeowners choose the best color for their space. Brennan says pi cking colors is the hardest part for a few reasons. It’s important to make sure they flow with the décor, flooring and especially the l ighting in their home because sometimes color samples happen to look different on their walls from what they saw in the store. And when it comes to the brand of paint, there is only one brand TJ’s Painting Company trusts—Benjamin Moore. Brennan says they have many different lines of paint to choose from and it’s the highest quality paint available. They treat every home they paint as their own with the highest level of care, and earn clients’ trust from the beginning of the process. So much so, Brennan and his staff complete many projects while the homeowners are not home. “Most of our customers work full-time and feel completely comfortable with us in their homes while they’re not there,” says Brennan. The dependability, attention to detail and highest quality of customer service TJ’s Painting Company offers is second to none and just a few of the reasons why it should be first on your list to call when your home is in need of a fresh look.